Respect, discipline, honor, loyalty, family, and courage. It is the mission of Brazen Martial Arts to provide training that encourages growth and development for each individual student at his or her own pace, with an equal emphasis placed on physical and mental conditioning. To this end, we are committed to helping our students set goals and achieve success beyond their current potential. It is our goal to provide a judgment-free environment that focuses on the traditional values of martial arts— respect, discipline, honor, loyalty, family, and courage— with the objective of improving leadership skills, social accountability, confidence, and self-esteem. We offer Mixed Martial Arts/Self Defense for children ages 4-13. 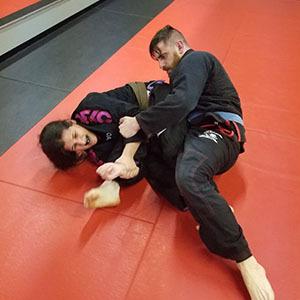 We offer adult (ages 14+) martial arts training in Mixed Martial Arts, No-Gi Submission Grappling, Gi Brazilian Jiu Jitsu, Combat Submission Wrestling (CSW – Erik Paulson), and Catch-as-Catch-Can Wrestling (Scientific Wrestling – Billy Robinson). We also offer adult fitness classes 6 days a week in the forms of Cardio/Conditioning for MMA and morning Fitness/Kickboxing. We are a proud affiliate of Erik Paulson’s Combat Submission Wrestling. We offer classes in Mixed Martial Arts/Self Defense for children ages 4* and up. Classes are divided into three age groups: 4-6, 7-8, and 9-13. 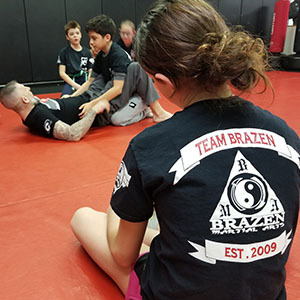 Brazen Martial Arts offers adult classes for students age 14 and up in Mixed Martial Arts, No-Gi Submission Grappling, and Gi Brazilian Jiu Jitsu (BJJ). 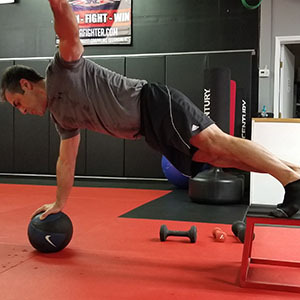 Workouts include kettlebells, exercise balls, medicine balls, weight bags, body weight exercises, battle ropes, and fitness kickboxing drills.